Chu Engineering was founded in early 1998 by a long time Buick enthusiast, Kent Chu, with the initial purpose of developing a more advanced data logging tool for these high performance vehicles. He holds a Master's Degree in Electrical Engineering from Columbia Univeristy and makes his home in Houston, Texas. Kent is also one of the original members of the Houston Buick Club - a local organization devoted to the maintainance and performance of all Buick powered vehicles. During the weekdays, Kent works at Hewlett-Packard as a Corporate Product Engineer for the Enterprise Computing Group, Industry Standard Server division. Along with Kent, his brother, Rex Chu, also helps run Chu Engineering. Rex handles the advertising and marketing aspects of the company while Kent takes care of the hardware and software design. Rex holds a communications degree from the University of Houston and currently runs his own business, a digital service bureau for the printing industry called ColorOne Systems. 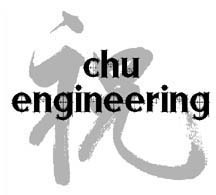 Together, Chu Engineering, strives to deliver the best product possible for these high performance, high class automobiles.